I hope you all had a lovely holiday (if you celebrate) and are having a happy Last Tuesday of the Year! I myself have enjoyed a luxuriously long week filled with several Christmas celebrations, Minecraft-playing, movie-watching, and book/comic reading. Presently, my family is waiting with bated breath for any developments on my very pregnant sister, due to give birth to my second niece any day now. While I wait anxiously for any news of contractions and water breaking, I will distract myself by continuing my "Two-Question Tuesday"series, the final installment of 2014! If you have a question you'd like to ask me, post it as a comment below and I will answer it in a future post. What is your illustration process? When I am working on a freelance project, the first thing I do is read the provided text thoroughly to get a firm grasp on the story. Then I read through the illustration notes (if any) provided by the publisher. Some publishers even provide very loose sketches along and the design layout of the project. I consider their sketches and begin thinking of how I can add my own ideas to what is required. Then comes the RRR Stage: I gather appropriate visual references, resources and research. As an illustrator I need to be adequately informed. This part is critical to my process, especially as I am often drawing things I've never drawn before and may know nothing about. Once RRR is done, I start sketching. Very scribbly thumbnail compositions first. Once I get an idea I want to follow through, I may have to go back and seek out more specific references. This often includes taking my own photos of figures in the poses I need. Then I use the references to create a cleaner sketch that I can send to the publisher for approval. Most of the time these sketches are black and white line drawings. If I have enough time before submitting the sketches, I might do a black and white value study to suggest how the final rendering will look. And if I have a good feel for where I'm going with the images, I might submit full color sketches in place of black and white. I like figuring out color and value as soon as possible in the sketch phase as it quickens the pace for the final images which are usually (sadly) always under a time crunch from the publisher. Once feedback is received, I make any necessary changes to the sketches and proceed to final images. In an ideal world, I would have enough time to work on the finals relatively leisurely, say 4 hours a day until they are all finished. Usually this is more like 12+ hours of work a day. This is frustrating because the quality of my work goes down after about 6 hours of painting. So in the rush to finish, I actually take much longer. I don't have the ability to slow down the process to better work in a way that I find enjoyable. I'd love to have the time to paint each illustration in black and white first so that I can sort out my drawing and rendering without also having to figure out color at the same time. But since rarely do I get that extra time, I have to figure it all out AS I'm working on the finals. It's hasty, it's stressful, and usually results in a finished product that does not meet my expectations. As for the illustrating process itself, first I scan the pencil sketch or refined drawing and set that layer to "multiply" in my Photoshop file. On a second layer ordered underneath the pencil layer, I block out the overall values (or colors) of the illustration. I also add a third layer on top of the pencil sketch on which I paint over the drawing as needed. I paint using a custom brush textured like chalk. It keeps me from getting too detailed, so I will also use a separate brush for line work and any smaller details. Once the images are finished, I place them in the layout the publisher provided to see how they fit with the text and make any small changes if need be. Then I send the flattened TIFF files to the publisher and hope they get approved. Working digitally, it's easy to accommodate last minute adjustments but it's always a relief when they approve them as they are! What do you hope to achieve by this time next year? Hmmm! An appropriate question to close out what has been a lovely year overall. Well, that's all for now. See you next year! Continuing "Two-Question Tuesday", in which I post and answer two questions each week, one pulled from some of the actual questions I've received over the years, the other a playful question I ask myself. I hope they provide a bit of insight into who I am and how (and why) I do what I do! Q1: What influences your doodle paintings? ....... I think the truest answer here is that not much influences my doodles. They just sort of happened on their own. Above is the basic evolution of my doodle process. It all began in 2004---doodling in black ink on white paper. After a few of those I naturally began to wonder: What if I add color first, and then draw over the painting? It progressed into subdued washes of watercolor backgrounds on top of which I drew with ink. From there it has been a steady continuation of that original method. Today, my doodles are far wilder in color. I paint more thickly using gouache and I also paint over some parts of the drawing and add touches of colored pencil to push the depth of the shapes and spaces. 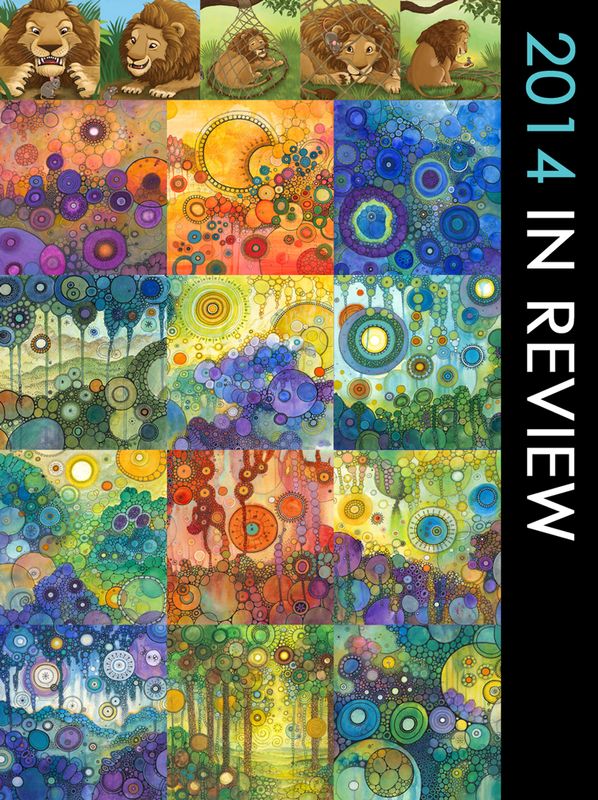 Abstract art has been an interesting departure from my representational illustration work. I like that my doodles allow for multiple interpretations---some people see cells, bacteria, bubbles, etc. To me they feel like microscopic worlds or galactic worlds--like alien planets. But I do not try too hard to convey these things literally. My doodles are the one thing I feel like I am discovering entirely on my own---without outside things influencing how they should look or what they should become. Occasionally I take initial color inspiration for my doodles from other pieces of art that have exciting color palettes, but I never plan too heavily when I actually paint them. I just sort of begin painting and let it take me wherever it goes. The reason why I call them "doodles" is because I am truly "doodling" as I create them, drawing whatever I want to, in whatever order I want to ---with no pressure for it to look a certain way. That's the point of doing them---it is a very free process (unlike my illustration work which is VERY constrained by the needs of the project or story). Q2: What is your favorite holiday movie? 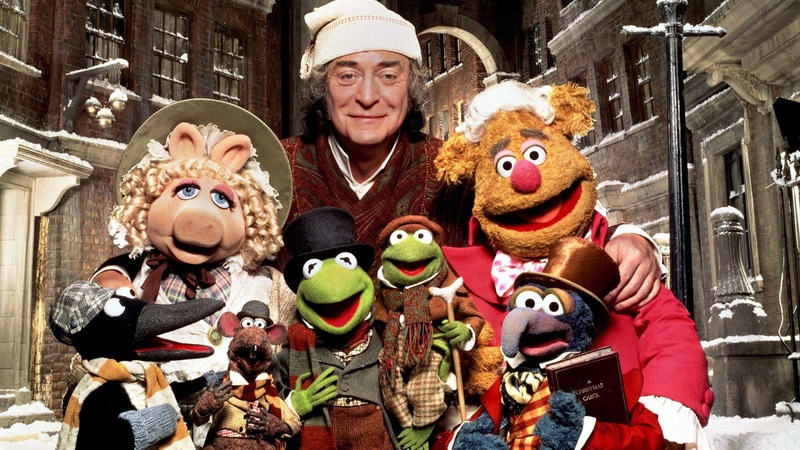 Without a doubt: The Muppet Christmas Carol. The story. The sets. The actors! Never have Kermit and Gonzo been better. Oh, and Michael Cane is brilliant, too. OOF! I think the ideas within the Christmas Carol story itself (whatever the iteration) can be appreciated by anyone who wants to find it in their heart to change for the better. Its message resonates very strongly within me, and as a non-religious person, this particular retelling is pretty secular-friendly. Funny enough, it is a muppet movie that brings out my humanity the most at one of the warmest and fuzziest times of the year. Wherever you find love, it feels like Christmas. That's a message to which I can truly relate. Brb, gonna go watch the muppets and cry. Continuing "Two-Question Tuesday", in which I post and answer two questions each week, one pulled from some of the actual questions I've received over the years, the other a silly question I ask myself. I hope they provide a bit of insight into who I am and how (and why) I do what I do! Q1: Did you take art classes when you were young? NOTE: I like to think that I am still young, but I get what you're asking...for the sake of argument I will address my relationship to art prior to age 21. As a child, I had regular public school art class like everyone else around me. But at home, my sister ---she's 3 years older---liked to draw and paint and it wasn't long before I decided I wanted to, too. Maybe part of me wanted to show her up a little? (I am the middle child, after all...) By middle school I was drawing a TON. It was my favorite thing to do, and all that outside practice helped me improve pretty quickly. Granted, the kind of art I was doing at the time involved realistic teeny bopper drawings of my celebrity crushes [see above, age 11: Devon Sawa], but I guess they served a grander purpose eventually. When I was younger, I spent most of my personal time drawing from photographs as opposed to from my imagination. It taught me certain basics of light/shadow/value, but now I wonder where I'd be as an artist if I had relied more on my imagination as a child...it's a part of myself I'm still trying to develop even at age 30. In high school I continued taking art classes as electives (i.e. advanced drawing and painting, portfolio, and AP studio art) but I was equally if not more concerned with my academic classes. I didn't want to be just a good artist, but a good student all around. My favorite teacher was my English teacher, Mrs. Sullivan (I had her sophomore year and senior year) who encouraged her students to approach their final projects creatively rather than just written essays. For The Lord of the Flies I drew before and after portraits of Ralph (see above, age 15), and for Macbeth I drew a poster montage of key scenes from the play (see above, age 17). I loved having the opportunity to fuse my art with my academics and will always be grateful for having had a teacher like Mrs. Sullivan. All throughout high school my number one pastime was drawing in my bedroom for hours on end. Most often by myself, but occasionally with the company of one or both my sisters. I was a pretty independent art maker motivated by a simple desire: make realistic portraits of my favorite movie stars to hang on my bedroom wall. It might not have been the most sociable use of my free time, but it kept me entertained through the stress factory that is high school, so I regret nothing! Q2: What is your favorite book? Oof! How do you pick just one when there are so many books that make your life a little more complete just by existing? UGH. Ok--- I know! I'll answer this in list form. These are the books I'd rescue from a fire. But if I had to pick JUST ONE book to attribute my entire being to, I'd pick Harry Potter and The Sorcerer's Stone. Reading this book at the age of 16 forever broke me of my adolescence-induced, too-cool-for-anything cynicism and showed me that it's ok to be a nerd/dork/geek/whatever and it's ok to openly admit loving that which you love. No more teenage apathy and negativity. No more putting people down for what they like, however different it may be from my own interests. Like what you like. Life's too short not to embrace the things that make you happy. I sat in bed with the dawning realization that this book, this writing and the world within those pages---Roald Dahl meets The Worst Witch but with a voice entirely its own--was the book I had always wanted to read. It felt as if JK Rowling was speaking directly to me. I was at once both 16 and 6, teenager and child, completely transported, my imagination unlocked. There is no spell strong enough to undo the magic this book cast on my life. 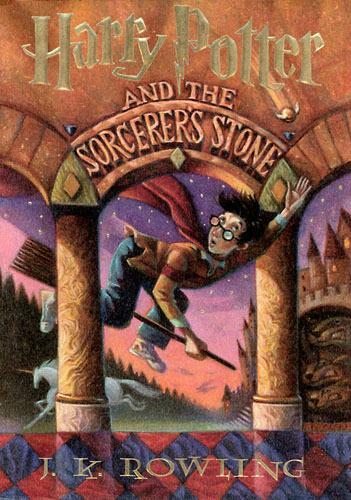 Harry Potter singlehandedly changed everything I thought I was by connecting me to my true, unapologetic, wide-eyed inner child. Without this book (and subsequent HP books), I would not have made the friends I did, or met the love of my life in my husband (also a huge HP fan), or done just about anything else that makes me who I am today. This book made me love books, reinforced my lifelong love of reading, and kindled a passion for children's literature in particular which gives shape and meaning to my life and career on a daily basis. So yeah. I guess I DO have a favorite book after all! Continuing with "Two-Question Tuesday", in which I post and answer two questions each week, one pulled from some of the actual questions I've received over the years, the other a playful question I ask myself. I hope they provide a bit of insight into who I am and how (and why) I do what I do! Q1: What artists influence you? I am a great appreciator of the work of many children's illustrators, although I don't actively try (or succeed) at making work anything like theirs. Instead, I admire their work because it looks like they sincerely enjoy their process. They are consistent in their dedication to quality and their craft, whatever their medium of choice. Most of my favorite illustrators have a recognizable, characteristic style that makes their work easily identifiable. Some of my favorites are Mary GrandPré, Linda Wingerter, Cory Godbey, Brett Helquist, Brian Selznick, Tony DiTerlizzi, Rebecca Guay, and Aaron Becker (just to name a few). If you know their work you'll probably notice that they all have distinctly different styles from each other and from my own work. By looking at these artists' images, I absorb valuable insights that I hope to someday be able to bring to my own art---insights into color, composition, lighting, character, style, etc. Qualities like strong drawing skills (good anatomy or intentionally stylized figures), use of interesting perspectives, dynamic environments, looseness of lines, use of expressive, dynamic shapes, and a sense of gesture and movement are all evident in the illustrations that strongly appeal to me (in contrast to my own work, which all-too often tends to become stiff and overworked). There is much to be learned from the artists I admire. Most important of all, my favorite artists remind me to enjoy myself, to work hard, and create with authentic passion. They're all so good at being themselves that I'm reminded to be myself, too (whatever that may be). Their techniques and processes encourage me to try something new, loosen up, and be playful. Their work compels me to continue to hone my drawing skills so that I can draw realistically when I need to AND be expressive when I want to. Q2: Are you obsessed with space, and why is the answer YES? I've always been dissatisfied with the sub par science education I received in school, and up until last year I'd spent most of my life avoiding heavy science topics altogether because I was intimidated by how stupid I felt trying to navigate it all. But I'm making up for lost time by throwing myself into it now, at age 30, with a level of passion and enthusiasm I've only ever experienced inside the art-making realm. Did you watch the Orion test flight last week? Are you following the New Horizons mission? There is so much happening right now--- it's a very exciting time to be a space enthusiast! While I was at RISD, I contacted illustrators I admired eager to glean whatever I could about what life as an illustrator was really like. Answers to questions like "How did you discover your style?" and "How do you navigate the vastness of the children's book industry?" provided valuable insight to me as a new and wannabe illustrator. Now, nine years later, I have the humbling pleasure of sometimes being on the receiving end of some of these very questions from students and aspiring artists. Imagine that! I thought it might be fun to have a weekly post themed around answering the kinds of career-oriented questions I've received. So I'm beginning "Two-Question Tuesday", in which I will post and answer two questions each week, one pulled from some of the actual questions I've been asked over the years., the other a playful question I'll ask myself. I hope it provides a bit of insight into who I am and how (and why) I do what I do! Q1: How did you get your start in the children's illustration industry? Getting a foot in the door as an illustrator can be remarkably hit or miss. My experience is not a very common one in that one of my first professional jobs was a legitimate picture book with a big publisher (believe me, I was just as surprised as you!). I graduated in 2006, and during that first post-grad year I spent a lot of time researching and learning about the industry I wanted to be a part of rather than actually being part of it. I created some sample pieces and spent 2007 prowling the RISD job board for illustration gigs. Eventually I got my first paying job that way, creating pencil drawings for a kind of paint-by-number kid's paint set. The money from that advance was enough to allow me and (my then-boyfriend) Adam to move to Boston and get real jobs so we could live together. From 2008-2010 I worked full-time as a web/graphic designer and sought out small illustration jobs when I could. Illustration was relegated to late nights and weekends. At the time that was enough. It kept me busy, brought in some extra money, and served to remind me what I truly wanted to do someday. After two years at my day job, I felt the itch to quit and try freelancing full-time. I also just so happened to have been contacted by an agent around that time. She'd also seen my work online and thought I might be good for the kind of work she often assigns. I came on as a Tugeau2 artist four years ago and have very much appreciated working someone so knowledgeable, accessible, and supportive as Nicole Tugeau. Most of the projects that come through Nicole are educational work. They pay well but sometimes prove challenging to the spirit. There usually isn't (in my opinion) enough time to explore in the initial stages before I have to pump out the final artwork. Generally after educational work wraps I'm completely worn out and frazzled. And I always wish I had more time to let the process breathe a little. I do the best I can with the time that is given, but with my part-time job sometimes it's very little actual work time. I'm 9 years out of RISD now but I feel like I'm still establishing myself. I still want to be a children's illustrator, but I'm realizing now what that really means to me: I want to make my own books and stories, and take on less educational work. Since I'm not relying on illustration to support myself, I don't really want to do work my heart isn't in fully---especially since I don't have to. It's a big world out there and I've inadvertently taken longer figuring out who I want to be as an illustrator than I originally intended. But I'm ok with learning little by little and improving project by project. Everything is a chance to get better. To get closer to being the artist I hope to someday become. Q2: If you were an animal, what animal would you be? People often remark that my cat Miette looks an awful lot like me, thus I have been likened to a cat by those who know her. But if I'm picking for myself, I'd say I would like to be a deer. I feel a kindred spirit with these wild yet gentle animals. For being so commonplace, deer are wonderfully majestic and mysterious. When I see them appearing out of the tree line or standing stoically in a field at dusk, l feel connected. Connected to all of nature and to my peaceful animal brethren, silently taking in the sights, living their quiet lives, hoping to remain undisturbed. Oh, and I, too, malfunction in the spotlight. So there's that.